SC Playground Party is the ultimate party package for kids who love RECESS and Running, Yelling and Having Fun! The party host will coordinate fun activities such as Obstacle Courses, Parachutes and other Fun Games and age appropriate activities. 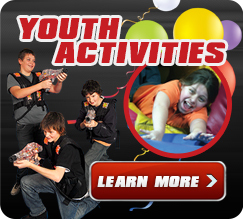 We encourage kids to pick 2-3 games or activities to play during their allotted time. The Playground Party can be combined with an Attraction Party at our Northlake location. You provide the kids. We'll provide the fun! Click Here for Pricing and Party Options for the BASIC, DELUXE and VIP-FLEX Party Packages. Walk-In Parties and Groups are welcome at some of our facilities, but are subject to availability for certain activity areas and attractions. Call us at 704-583-1444 for details. To inquire about scheduling and availability, please complete our Party/Group Request Form. Completing this form is the fastest and easiest way for our party/group specialists to determine availability and respond to your request. If you have questions, the best time to talk with a party/group specialist is Monday - Friday between 10:00 am and 4:00 pm. For information on our rescheduling and cancellation policies or to view our online waiver and online invitation, Click Here.